This year’s international home and housewares show was a whirlwind of new design, awesome products and free samples. 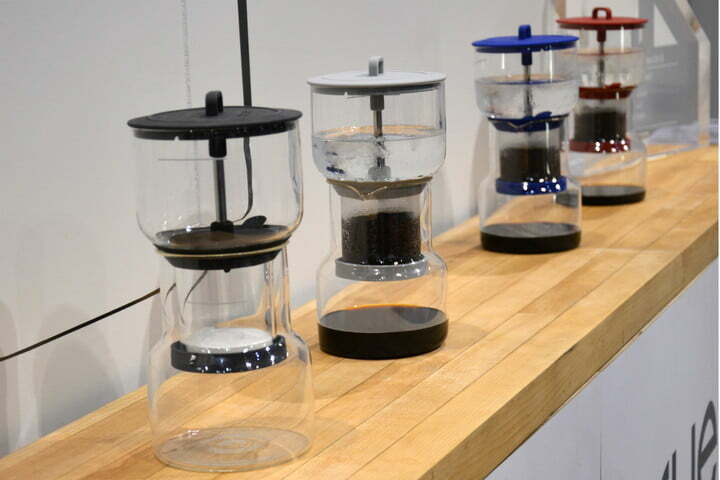 Here’s our recap of Fellow’s sneak peek of Stagg EKG at IHA and our top picks for coffee products at the show. By far the best part of IHA was meeting a surprising amount of Stagg EKG backers at the show. As we put the finishing touches on EKG’s design via Kickstarter surveys – snagging backer feedback in person with a live prototype is a huge help for us to finalize a few lingering design questions. Plus, it’s always great to see backer reactions live. Want to see Stagg EKG in action? We’re bringing EKG to SCA (Specialty Coffee Association of America) in Seattle end of April. Grab your tickets and we’ll see you there! There’s a new home roaster on the market (well, almost on the market). This sleek home roaster has a super compact design, making it ideal of roasting small batches. Look out for the launch of Kelvin sometime this year! Get It Right’s Voltaire Grinder aims to solve two problems – fresh beans and consistent grind. Combine that with a compact design and they’ve made a sleek looking grinder that should be an interesting one to watch out for. The grinder connects to their smartphone app to measure bean freshness and gives replenishment alerts. Its battery lasts through 3 lbs of coffee so you can take it on any adventure.